When it comes to vasectomy-oriented puns and jokes, Dr. Roger W. Jump III has heard them all! Still, it didn’t stop DJ John Cruz from trying during an interview with Dr. Jump which aired on March 14. He did his best by linking “jump shot” as a play on the befitting last name of urologist Dr. Jump. The well-intentioned humor via the airways is part of the collaborative March “Vasectomy Madness” contest. Vasectomy Madness may seem like a unique contest concept, however, it’s one that has been not simply well-received, but highly participated in—even competed for! Find out why when it comes to a vasectomy South Bend guys seek, the Urology Associates of South Bend is the top choice. Wait a minute … a competition for a vasectomy? Yes! This doesn’t come as a surprise to Dr. Jump, who recently shared with radio listeners that spring is a common time of year for vasectomies. The collaborative contest partnership between 97.7 ROCK and The Vasectomy Clinic of Michiana received an overwhelming response as men (and their significant others) from all over the Michiana area shared testimonials of why they were the most deserving of a vasectomy. This includes winner, Bradley Kitts, one of four finalists for the Vasectomy Madness contest. While Kitts (deservingly) won the Vasectomy Madness contest there’s good news for others seeking an effective, permanent form of birth control. The Vasectomy Clinic of Michiana is offering 30% off vasectomy surgeries for the month of March. Kitts, in addition to those taking advantage of March Vasectomy Madness discounts, have the added advantage of not only a free and 30% discount (respectively) on the procedure, they have the benefit of receiving a vasectomy from experts like Dr. Jump, who come with combined decades of experience. As a graduate of Michigan State University and MSUCOM, Dr. Jump earned his doctorate and completed residency training in Urological Surgery through the St. John Providence Health System. All urologists with The Vasectomy Clinic of Michiana, in addition to having extensive experience in providing vasectomy procedures, are dedicated to offering the most innovative approaches, including DaVinci robotic surgery. 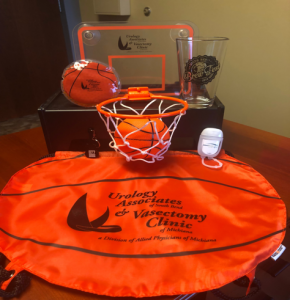 If you’re a male between the ages of 25 and 45 considering a vasectomy South Bend USAB doctors specialize in and would like to take advantage of 30% off a vasectomy and receive a special goodie-filled “recovery bag,” call us today at (574) 234-4100 or click here to get started.